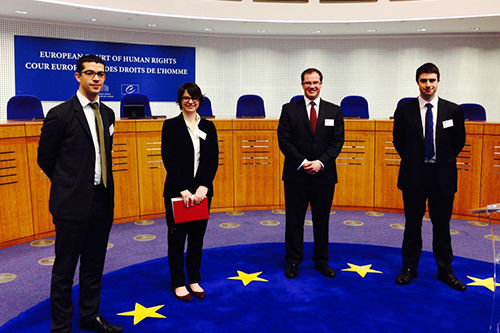 A team of students from The City Law School has won the European Human Rights Moot Court Competition. Ali Nihat, Niall Coghlan and Howard Leithead, who are studying the Bar Professional Training Course (BPTC) at City University London and Anna Dannreuther of the University of Law, beat leading teams from across Europe. They triumphed in the grand final against opponents from the University of Athens and in front of a jury of 9 human rights law experts. The City team will be awarded the Council of Europe Prize; a month-long traineeship at the European Court of Human Rights in Strasbourg. "The quality of the advocacy has been superb and it has been a privilege to sit behind the team from City. Their submissions and responses to questions have been of an exceptionally high standard. They are deserving winners of both this prestigious title and the opportunity to train at the European Court of Human Rights". The moot, which is a simulation of a court trial, began in August when teams were asked to examine a fictitious case. Seventy-two teams from 29 European countries drafted written submissions for the case which concerned defamation and hate speech in relation to freedom of expression and media freedom. Sixteen teams were then selected to travel to the European Court of Human Rights in Strasbourg to plead the case during the final rounds. The team from The City Law School excelled in the closing stages of the competition, beating strong opposition from Kaplan in the semi-finals. "We would like to thank The City Law School for its support during this competition. Clare Brown has been a fantastic coach and we are grateful for the substantial contribution that City made towards our expenses. The four of us met at City on the GDL course and we have derived considerable benefit from having been students there. He continued: "In the European Finals we successfully competed against teams from the UK, including those from Kaplan and BPP Law Schools, as well as against teams from other European countries. It was wonderful to have the opportunity to moot in the European Court of Human Rights and we have learnt a great deal from the experience". The competition is organised by the European Law Students Association (ELSA) with the support of the Council of Europe. It is designed to help students understand the principles and implementation of the European Convention on Human Rights. It is open to all law students in ELSA Member Countries as well as Council of Europe Member Countries. "We are delighted by the success of our students and we also celebrate the vigour of the mooting programme at all levels across The City Law School. We are actively expanding our engagement and are on target to build a reputation as one of the best moot programmes in the world". The City Law School has an exceptionally strong record of mooting success. Students won several prestigious national and international competitions in 2013. BPTC students Matthew Fraser and Jelia Sane took the top prize at the Human Rights Lawyers Association Judicial Review Mooting Competition in April. Matthew Sellwood and Daniele Selmi took part in the 13th Commonwealth Student Moot held in South Africa. It was the first time in ten years that a team representing the UK had triumphed. This year, The City Law School unveiled its first ever Senior Moot, adding to its existing roster of internal competitions. Open to all postgraduates on the School's professional programmes, it is sponsored by property experts Savills and carries a total prize fund of £2,000.